One of the causes of the �crisis� in the music industry is the fact that too many works are recorded over and over again. There are innumerable CDs with Vivaldi�s Four Seasons or Pergolesi�s Stabat mater. But once in a while someone has the imagination to perform and record a completely unknown piece by a composer hardly anybody has ever heard about. Antonio Florio is one of those creative minds who concentrates on little-known repertoire. In the last decade or so he has explored the musical past of his city, Naples. This time he presents a composition by an Italian who, for the largest part of his life, worked in Vienna. Badia was born in Verona and went to Innsbruck at a young age. There the step-sister of emperor Leopold I, Eleonore Maria, had her own court. Badia became her court composer and wrote oratorios to be performed during Holy Week from 1691 to 1693. He also composed an opera, performed in 1692. In 1694 Eleonore Maria moved to Vienna. There Badia became court composer at the court of Leopold I himself, alongside his fellow Italian Antonio Draghi. And in the following years he got some colleagues who are still well known and respected: Fux, Torelli and Giovanni Bononcini. During his years in Vienna Badia composed oratorios for the Ursulines, who on the feast day of their patroness, St Ursula (October 21), offered the emperor a musical performance. Badia was also sent to Rome to study, married a singer, composed an oratorio for Venice and an opera for the court at Dresden. 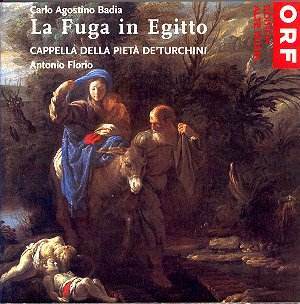 In 1703 he was given the libretto of the oratorio �La Fuga in Egitto del Patriarca S. Giuseppe con Giesù e Maria�, composed by Giovanni Maria Casini, organist at Florence, and performed there in 1697. The emperor himself had a copy of the libretto and since he liked it, he handed it over to Badia. In 1703 the Ursulines sang the work before the imperial couple who had come to visit their convent on St Ursula�s Day. The scoring is sober: five solo voices, which also sing the �Coro� sections, with two violins, viola and basso continuo. Anyone familiar with the dramatic vocal works of the baroque period will not be surprised by the predominance of high voices. On the one hand this reflects the aesthetic ideals of the baroque, on the other hand it met the popular preference for virtuoso castratos singing the main roles in operas and oratorios. But in this particular case it has nothing to do with the fascination for castratos. There was a simple and very practical reason: all the roles were supposed to be sung by the nuns themselves. The only lower part is that of San Giuseppe, who is a tenor, but even that role was probably sung by a nun. It is known from women�s convents in Italy that some women were able to sing some tenor parts. Strictly speaking this work is anonymous: the manuscript doesn�t give a date or the name of the composer. But since there is a copy of the libretto of a performance by the Ursulines in 1703 with Badia�s name on it, the attribution of the oratorio to him seems to be reasonable. The libretto is based upon the story of Joseph and Mary, urged by the angel to flee to Egypt to escape the slaughter of little children in Bethlehem by king Herod, as told in the gospel according to St Matthew (2:13-18). The story itself is dramatized, as is the case with so many biblical oratorios of the time. These are in fact religious operas, stylistically not very different from real operas. In this case, though, there is little interaction between the protagonists. Short recitatives are mostly followed by an aria, most of them da capo arias, but some relatively short (less than two minutes). The most dramatic moment is in the second part, when Herod decides � against the advice of his Counsellor (Consigliere) - to slaughter all recently born children, hoping to kill the newborn King (Jesus) with them. There is nothing wrong with the music, though. There is a lot of expression, both in the arias and the recitatives. The fugue does appear in the score on a regular basis, probably inspired by the title of the work. There is (almost) nothing wrong with the performance either. Most singers are well-known representatives of the Italian baroque scene who regularly work with Antonio Florio. The casting is very good. I was in particular impressed by Daniela Del Monaco, whose low voice � going down well into the tenor range � is supremely qualified for the role of Herod, the villain of the piece. I am very happy with the rhythmically free way the recitatives are dealt with, which gives the impression that the singers are really �acting� the roles they sing. The arias are also done very well, with nice ornamentation. In the �Coro� sections, sung by the soloists, the blending is excellent. All the singers being Italian, pronunciation is no problem. The only reservation I have in this regard is that the �r� is a little too strongly projected by some singers (in particular Emanuela Galli and Rosario Totaro), whereas the preceding vowels are sometimes too short and lack clarity. The ensemble gives the singers excellent support and their playing is lively and technically assured. The fact that this is a live recording results in some minor technical shortcomings, like a lack of synchronisation here and there, but on the whole this minor defect is hardly worth mentioning. In short: this is a very good recording of a nice work, which I wholeheartedly recommend, in particular to the inquisitive among us.